Here you can gain an insight into the current work being done within the School to promote equality and ensure that the School is the best possible working environment for all. ‘The Athena SWAN initiative is about improving work practices for all of us. The changes introduced through the Athena SWAN process to address gender equity issues will also benefit staff with young families, those caring for elderly parents or others who need us, as well as our own self-care outside of our work lives, men & women’. Yvonne Buckley, 2016. Figure 1: Percentage of men and women at each academic career stage in the School of Natural Sciences. UG = Undergraduate students (3rd and 4th year students only), Taught PG = Taught Postgraduate students, Postdoc = Research Assistants and Research Fellows. Figure 1 shows the percentage of men and women at each academic career stage in the School of Natural Sciences. 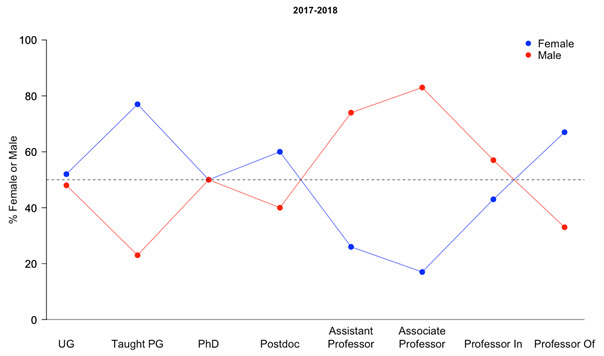 There is an obvious decrease in the percentage of women at the Assistant Professor stage, and this gender imbalance is the most extreme at the Associate Professor level. Although in our School there are more women than men at the highest level, there is still cause for concern as the progression of lower level academic staff through the School may eventually lead to gender imbalance at the higher levels. The School is committed to putting in place measures to ensure the retention and advancement of women in the School. Note however, that the data presented in Figure 1 are based on very small numbers - the School has only around 46 members of academic staff. Also note that these figures are updated yearly so may not reflect numbers at present - this is especially an issue for postdocs who tend to arrive and leave throughout the year. As part of our continued commitment to equality, a School-wide survey has already been conducted to identify important areas in need of improvement. The results have been compiled as a document and include proposed actions to be implemented to enhance equality and inclusion as part of our Athena SWAN Action Plan. As part of our continued dedication to the improvement of our School, an application for a silver award is currently being prepared. See below for information on staff supports, some frequently asked questions about gender equality in science and why it's important, a list of some of the positive changes we've already implemented or plan to implement soon and research profiles from some of the female researchers in the School. Biographies of the School’s Athena SWAN Self-Assessment Team can also be found here. Check back regularly for updates on our progress!